Lebanon is bordered by a 150 mile Mediterranean coastline to the West. This is only 30 miles from the two mountain ranges along its eastern borders and it is, therefore, one of the few places in the world where water and winter sports can be undertaken in the same day. The Phoenicians occupied Lebanon from 3,000 BC and were renowned for their navigational skills, trading well beyond the shores of the Mediterranean. They were entrepreneurial artisans exporting culture as well as fine goods, and gave the world the first alphabet to link signs to the spoken word. The Phoenicians were a peaceful civilisation, and although well protected by the mountains to the East, their elongated coastline was difficult to defend; the country was successively invaded by the Amorites, Hyksos, Egyptians, Hittites, Persians, Greeks and Romans, and it became part of the eastern bloc of the Byzantine Empire. Lebanon co-existed fairly successfully with the Ottoman Empire up to the First World War, evolving a hybrid of eastern and western cultures. The development of these influences, together with French occupation between the world wars, produced the most prosperous and beautiful country in the Middle East. However, the delicate balance between east and west that had been the hallmark of Lebanese history, was shattered in 1975 by a turbulent and destructive 17-year civil war from which the country has taken time to recover. Our invitation and sponsorship to Lebanon was from Mme Bustani, and we undertook three performances of the Verdi Requiem as part of the Bustani Festival, in Beirut, Batroun and Tyre. 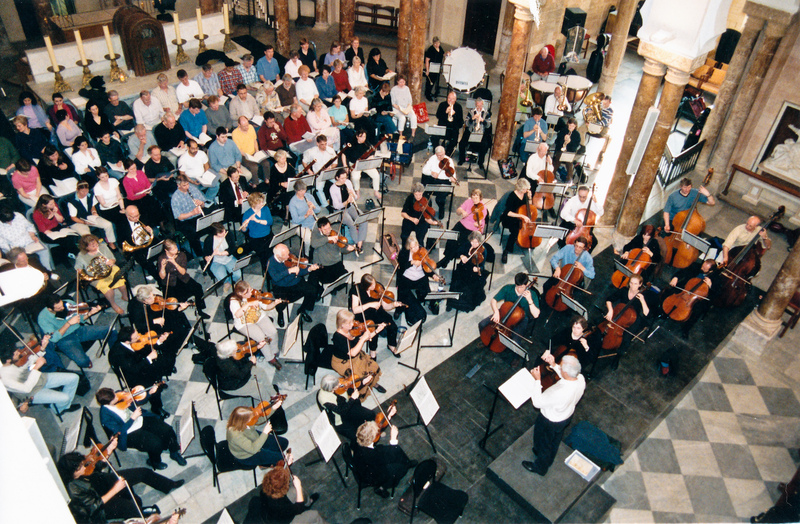 BAFCO was supplemented by string players from the symphony orchestra, and choristers from the conservatoire. The unique setting of each performance and large, enthusiastic audiences contributed to memorable performances. Our thanks are extended to Mme Bustani for this marvellous experience, that also incorporated exploration of many of the architectural wonders of Lebanon. Of particular interest were the massive and beautiful remains of the Temples of Baalbek, representing the worship of successive civilisations and containing the world’s largest cut masonry stone, dating from the Roman period.